I’ve never had as much fun delivering a presentation as I did last night while co-presenting “The Revolution Will be Syndicated” with Tom Woodward in Second Life for NMC’s Rock the Academy conference. It was nothing short of a blast, and our guiding logic while preparing this “talk” was to make it fun and use the virtual space to our advantage. I think we came close to accomplishing both of these strategies by getting ourselves some “mother trucking zombies” (to quote Tom), some badass flamethrowers, and a heavy dose of LMS lambasting. Hats off to the NMC crew, in particular Alan, for making this possible. They bent over backwards to meet our requests for zombies, WZD (weapons of zombie destruction), sun glasses, t-shirts, and even changing Bb advertisements. Moreover, they gave us free reign to go crazy (in spite of their organizations best interests 🙂 ). I think this presentation was just further evidence for me that given the tools and possibilities of the web, there’s no reason to transport the tired means of communicating in these new spaces. I mean, come on, how can setting the entire audience on fire, literally, ever be considered a failure in presentation terms? Alan seemed to get a kick out of it, and given his unbelievable presenting prowess, I take that as a great compliment. I’ve included the video below (an impressive turnaround time indeed), and I hope you enjoy the madness as much as we did, although I think it would be hard to re-capture the moment that we actually experienced in Second Life at that time. And let there be no question that Brian Lamb’s (who was sorely missed last night) presentation in Second Life for NMC last Spring was the creative genesis and standard we tried to meet for this performance–not sure we got there, but it is nice to have something to aspire to. 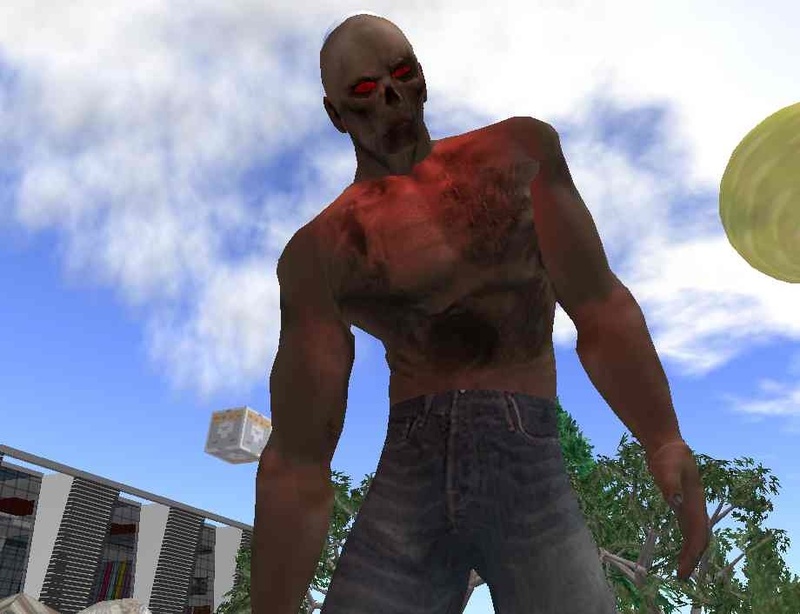 This entry was posted in presentations and tagged fun, NMC, presentation, revolution, second life, syndication, teaching, video, zombies. Bookmark the permalink. 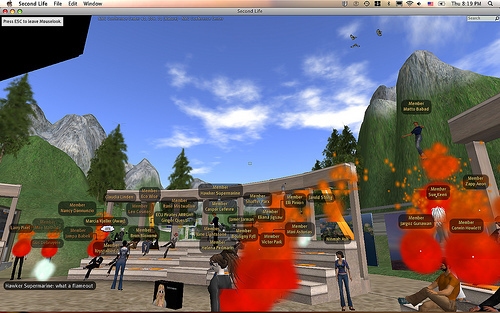 Saying I had a good time in Second Life means something and I had a good time in Second Life. I’d rather present there than in Adobe Connect any day. Imagine doing Nonprogramistan in 2ndL. We could ride in on a tank, wave banners, burn some effigies, do that crazy Russian squat dance. . . . all while looking like those nesting Russian dolls. Barry Dahl, I changed my mind. Second Life IS worthwhile. Now excuse me whilst I hunt down some Glasses of Truth for myself. @Tom- why stop at a presentation or some dances of Nonprogramistan? Why not create a virtual country or village? Make it a shrine to the motherland. I thought Tom was joking when he said this presentation involved zombies and setting people on fire… When am I going to learn not to put anything past you two crazy EduPunks? This was fantastic. 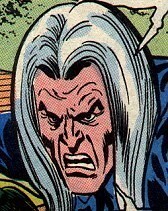 I blame all the shennanigans on your special man friend. I really wanted to do a straight talk with suit and tie, but he kept pushing and pushing. Sometimes he is a hard person to say no to, but in the end I guess he was right. And the Floyd homage at the end, awe inspiring! I am so glad they left the audio of you singing in at the end. Jim Groom, I love you man! This one had your name all over it, and if I wasn’t a total idiot I would have talked about http://freelearning.ca when the qquestion of support came up. The statement you made in this post about not caring who it belongs to was beautiful and inspiring. In fact, your logic in that post of others using your resources through another mapped domain has made me think longer and harder about the future of UMW Blogs. So thank you, you’re one of the world’s finest educational survivalists, and it is a pleasure to break bread with you in person and virtually. I thought the flamethrowers and burning symposium participants was a fantastic touch! There are several reasons for this too, really. First of all, you can’t incorporate massive guns, zombies, loud music and fire into a presentation and leave people bored. It was a really engaging tool. Secondly I felt it was completely in line with the overall theme of the presentation. You took the notion of a conceptual revolution and gave it a visual presence. Plus the whole anti-authoritarian sensibilities of the edupunk movement are such that an in-your-face tone is quite relevant and appropriate. Playing Mozart and speaking softly would have felt out of phase; images of Che Guavara, military dress and fire didn’t feel out of phase. Finally – and this has only just occurred to me – the use of fire could in some ways be thought of as a metaphor for change. Fire takes existing structures and destroys them, and out of this new life is able to grow. In Australia for example, the landscape has evolved to the point where fire is a requirement for growth. Besides you both burned yourselves too, so there was the sens of the entire Colosseum undergoing a Baptism of Fire. It was the best presentation I’ve been to in a long time really – you guys did a phenomenal job 🙂 Thanks again! Soon to be blogged, but I found the archive video on my hard drive, and reposted to vimeo.